Over a year in the making, this special episode features my favorite fails and laughs from across the entire Fails of Reach series. Every single clip is a moment that I personally experienced in Halo Reach matchmaking. So watch and laugh at me…. I mean with me…. oh never mind. On a personal note, I would like to say ‘thank you’ to everyone who has watched, enjoyed, and supported The Fails of Reach over the past year. Thanks to you the series has already reached a combined 500,000 views and almost 2000 subscribers! If you are late to the party, check out the Fails of Reach feature page to watch the complete series! 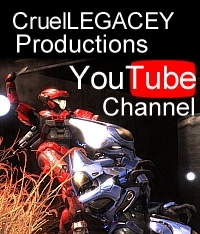 This entry was posted in halo reach, The Fails of Reach, Video and tagged cruellegacey, fails of reach. Bookmark the permalink.